This set of instructions was developed, in part, during the Digital Humanities Winter Institute at the University of Maryland. Under the direction of Wayne Graham, a small group set out to install Omeka through Amazon Web Services. The directions were put together collaboratively by David Kim and Cory Duclos. Unlike other Omeka installation guides, this one does not pretend to be “easy.” There are some technical abilities you will need, including being comfortable using a terminal. This guide was written using OS X, but if you are a Windows user, the Git Bash prompt that ships with Git should work. Ideally, you should be doing this install on your own, private computer so that you can add security permissions for future server access. 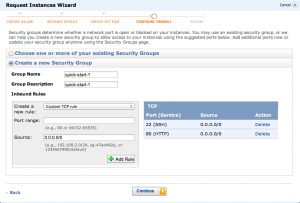 Step 1: Create an amazon web server account at aws.amazon.com. This will require entering a credit card and going through a phone verification process. 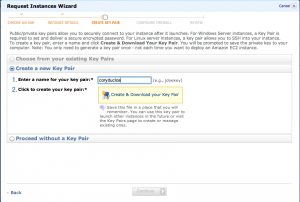 Create key pair, adding in a unique username (which will be used again in step 14). This will cause your system to download a .pem file. Leave it where it is for now. From the drop down menu on the left, select select “HTTP” and click “add rule”. It will appear on the right. then Close in the next window. Step 9: The easy part is over. 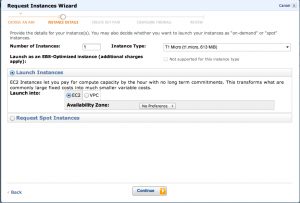 In the subsequent panel, RIGHT click on the code under “instance” and select ‘connect’. 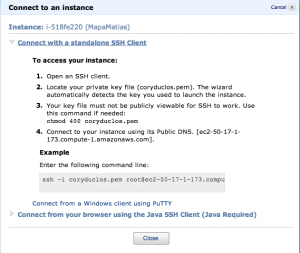 Select “Connect with standalone SSH Client” do not close window yet. 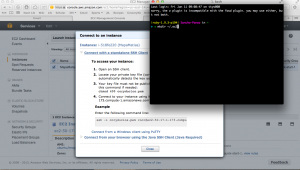 Open the terminal (Applications/utilities/terminal for OS X users); note that your color scheme may vary from these screenshots. 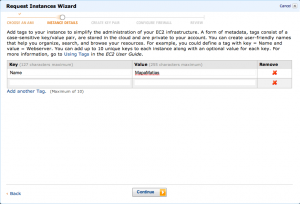 The username is what you generated in Amazon EC2 in step 6. **Step 16:** Back in your web browser, copy the line in the box labled "**Enter the following command line:**" (begins with '_ssh_') and paste it in terminal. If it tries to run by itself, you copied the return. _Hit the up arrow_ to call back the command so that it can be edited. You won't run the code exactly as you copied it. to update the server libraries. This command will generate a wall of text. Your server is up and running. Now we can shift our attention to installing all the libraries Ubuntu needs to run Omeka. After the server is up and running, we need to get the components that are needed to run a web server installed. I'll use a short-hand here to install a bunch of packages (and their dependencies). Then tell the Apache daemon to enable the mod_rewrite module that Omeka uses to make "pretty" URLs. 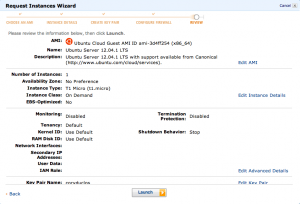 NOTE: When logging onto the AWS server, you may be put into the ubuntu directory. You need to get to the main directory. 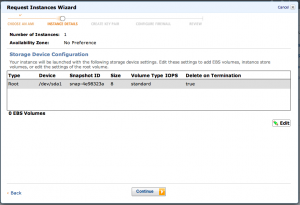 Change the directory and verify by listing the files in that directory. 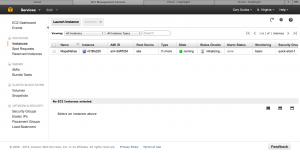 As part of the installation process, you'll be asked to create a 'root' account for the MySQL server. Just remember whatever you use for this account as you'll need it later to create the database and user for Omeka. After the installation and configuration has finished, you can test that the web server is running by pointing your browser at the server name you have (it'll be something like http://ec2_123.345.56.78/, whatever the server connection in the AWS panel is). If everything is correctly to this point, you should see a page in the browser that says "It Works!" 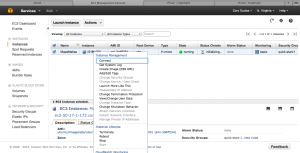 The default location for the web applications for Apache2 is `/var/www/`. For the purposes of this tutorial, we'll download the Omeka application and mv the files here. Now that the database is set up, we need to let Omeka know where to go to connect to the database. If you went to the Omeka path on your system right now (e.g. http://yourEC2.instance/omeka), you'll notice that there's a big error on the page. We need to tell Omeka where to look for the database connection, and the tools for doing this can be kind of scary on the terminal. Then you can get in to edit this file using the sudo vim command. Leave everything else the same. Hit control + c to exit the edit mode and :wq to write and quit out of the program. In your browser navigate to  http://yourEC2.instance/omeka and you should be ready to install. Find the instruction in this document which tells you to uncomment a line and add your own directory. Make the changes using the vim commands from above. Then navigate in your browser back to your site and you should be able to run the install. To add a plugin, navigate to the plugins folder in terminal, copy the link for the plugin download, and run the following commands. This will download a .zip file, unzip the file, and delete the original .zip file. The plugin should then be available in your omeka. The code below shows how to install the Neatline plugin, but this could work for any other plugin. Cite this post: cory-duclos. 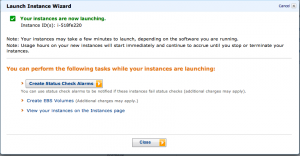 “Installing Omeka through Amazon Web Services”. 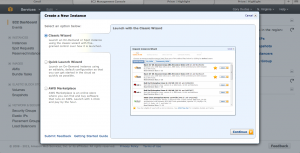 Published March 28, 2013. https://scholarslab.lib.virginia.edu/blog/installing-omeka-through-amazon-web-services/. Accessed on .